photo by Frank Iglehart. It's of the Sawang at the southern end of the trip, working his way down a rocky trail. 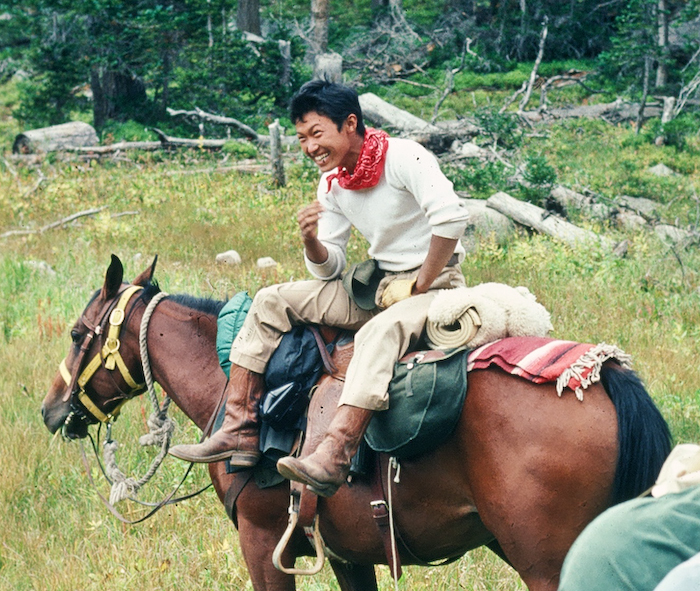 It was around the year 1980 when the Sakyong (who was then 18 and had the title of “Sawang”), John Cunningham and I got the idea to do something really western: we would ride horses through mountain wilderness. Both John and I had served the Sawang as both kasung and kusung. On a few previous occasions, the three of us had rented horses by the half-day from a sheep ranch north of Boulder. We’d ride their ponies into the foothills above the farm, up toward the town of Lyons to the north, and race back down, grabbing hats off each others heads and exploring the maze of beautiful pastures punctured by tall slabs of rock. But that was pretty much the limit of our trail riding experience. All we really knew about long distance horse packing came from a couple of skinny books from the local tack shop. We didn’t know any professional packers to ask for advice. (“Will you tell us what to do so we don’t have to hire you?”) One thin paperback happened to mention an old cowpoke method to help gear stay on the back of a packhorse. This was called the Diamond Hitch, and it was simply a length of rope carefully woven over the load on a horse’s back. The patterns and knots were too detailed to remember, so we made a quick photocopy and stuck it in a pocket. 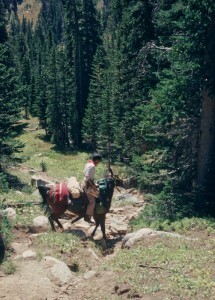 From a farmer north of Boulder we borrowed an old dusty saddle shaped like a vertical X that helped hold a pack on a horse’s back. Our food options were limited. We attempted to make beef jerky in an oven, but it kept turning out like road kill left in the sun. Freeze-dried camper’s meals in those days were an acquired taste, at best. Canned food would be too heavy for the one packhorse. So we finally settled mostly on small cans of beans and boxes of macaroni and cheese. To reduce weight and bulk, we brought a tarp in place of a tent. As corny as it seemed to wear cowboy hats, we had found that they were the best for shade from the high altitude sun as well as for keeping rain out of a coat collar. The three of us talked to every horse farm we could find about renting cow-ponies. Several liked our plan. Of all places, a real-estate development outfit on the way to the then-named Rocky Mountain Dharma Center (now Shambhala Mountain Center) offered rental horses to prospective buyers who might enjoy a cowpoke tour of the lots for sale. Their stable was at a relatively high altitude which meant that their horses were already acclimated to the high mountain air where we wanted to go. This lessened the risk of a debilitating lung injury that horses can develop when ridden at altitudes higher than they are accustomed. The manager was a pretty, young woman with athletic moves, and eyes that seemed to size us up in a few seconds. We had met her briefly a few months before and hit it off right away. At that time, we were stopping by to ride their horses up into the hills and open pastures for a dramatic view down the walls of what may have been the Poudre Canyon. We described our plan to her, and she seemed confident about the safety of the horses. She asked us to pay only a very little for the rental. The time of year was good. Late August weather in the mountains tends to be predicable and dry. But autumn storms can come early. People would eventually make it out, but horses might not. Mark Thorpe generously borrowed a livestock trailer from his father. On a Sunday a week before Magyal Pomra Encampment (MPE), a program of advanced training for members of the Dorje Kasung, we loaded up and headed north to pick up the horses, then drove north into Wyoming before turning south down paved, then unmarked dirt roads back into Colorado. We came across a park ranger in his pickup and asked for directions. He grew increasingly uneasy as he listened to our plans. We were three guys from the city who had four horses and plans to ride 70 miles, most of it through wilderness at high altitude. And he knew that blinding storms can arrive without warning. Ahead was the high crest of the mountain range with only vague markers to show the way through. His face was expressionless and he turned from us without making eye contact. Eventually we located a level area for the night. After unloading everything, Mr. Thorpe left with the truck and trailer. We were now alone in the Medicine Bow Mountain Range (USGS map Kings Canyon Quadrangle), settling in for the night at approximately 9,000 feet. The plan was to work our way up to the Rawah Lakes closer to 11,000 feet, and then travel further south to Chambers Lake. The horses spent the nights tied by rope to a run-line, which is a rope strung high and horizontally between two trees. This allowed them to eat and even lie down without getting their strong but vulnerable legs tangled in the rope. The horses seemed to be familiar with the routine and settled right in. The first morning’s sky fortunately was clear and very blue. Rising before dawn, we prepared breakfast for the horses and us. Packing up took about four hours, and we were very happy to get started. The horses seemed particularly ready – their walk was energetic as they headed up the mountainside, ears turned forward. photo by John Cunningham. The Sawang ready to start riding for the day. 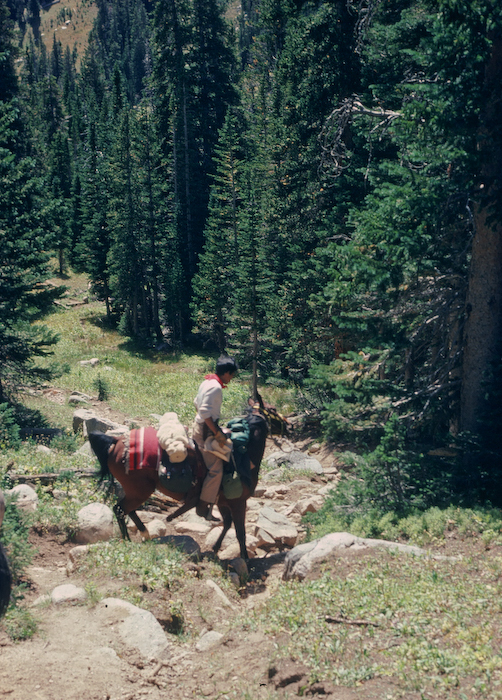 Every item of the 100 pounds of gear and food was essential and had to be balanced and kept stable on our one packhorse. With each step the load shifted to the right and then left. Eventually a can dropped out, then a bundle of clothing began to hang down, and then the weight shifted and was lopsided to one side. Like a good-natured horse will do, the packhorse just moved on with the woebegone look of a teenager made to take out the garbage. But this eventually could cause him harm. So we dismounted, collected the dropped stuff, un-knotted the Diamond-Hitch, unpacked all the gear left hanging off the horse, and got out the photocopy. We carefully reviewed every step of the knot, like students in a science class examining a difficult text book, while, at the same time, trying not to let the stiff wind blow the paper out of our hands and off the mountain. After repacking and slightly changing the pattern across the load and under the horse’s belly, we set off up the mountain. From that point on, the web of rope and its knots counter-adjusted for the continuous movement, and no more gear dropped off. For the first few days we rode the spine of the Medicine Bow Mountains, which unfolds as a series of forests and alpine meadows. To the east was a seemingly impenetrable forest extending to the horizon, and to the west there was a drop to the valley floor below that looked too steep for a horse to traverse. A strong, steady wind blew all day long, every day, making it necessary to shout to be heard from horse to horse. To our surprise, there was no clear trail to follow. Our maps were not detailed, so it was essential to sight small rock cairns maybe every 100 to 200 yards. If clouds descended, we’d lose sight of the cairns and become stranded. Once out of sight of our first-night’s camp, the only way was straight ahead and south for 60 miles. Unexpected snow or simply one thoughtless act could injure a horse, especially a leg, and prevent it from making it out. A sobriety began to settle in and the expression on the ranger’s face came to mind. Many thanks and very cool. I’m looking forward to part two! Oh yes, this is wonderful! And the suspense is killing me! Don’t wait another couple of years for the next episode! And the photos are great! The Sawang looks so happy! Thank you for this. Looking forward to the next installment. I’ll bet the prince becomes a king!